A laneway entrance; leather banquette seating interspersed with tall tables and bar stools; giant-size posters spruiking revolutions; Melbourne's funkiest light fittings (large, rectangular shades pasted with newspaper cuttings); and extremely fine food and wine service. 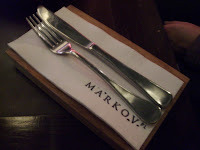 Carlton's Markov Place has got it going on. The bar/restaurant is a cross between a gallery and a cellar: it's only one room, so the whole atmosphere, in part set by the poster'art around the walls, is appreciable in the way of a suburban artspace. The tall ceilings and stone floor, as well as the fact that it's downstairs from the adjoining (recommended) cleanskin shop that faces onto Drummond St, gives its patrons the feeling of being underground. Amongst all that atmosphere is the chance to sample a succinct, thoughtful menu and a very sophisticated drinks list. The menu extends from sides such as fries and aioli for $8, through to snacks around the $15 mark and mains in the mid-$20s. 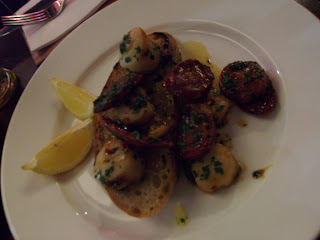 Late on a Friday, our order, to share, served our post-pub pre-gig hunger well: aforementioned stringy fries with a serviceable aioli; pan-fried scallops with chorizo, lemon thyme and chilli, served on sourdough bread; and autumn mushroom bruschetta with manchego. 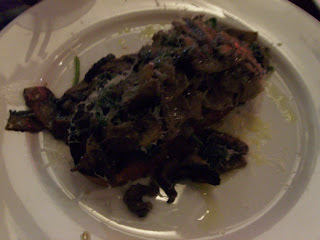 The mushroom bruschetta was a triumph - a mound of seasonal fungi spilling off yet more sourdough (we'd had two complimentary slices with oil as well), out of which also tumbled some spinach. Slippery jack, shiitake, swiss brown and pine mushrooms had all soaked up a generous amount of oil and butter and the variety lent a wonderful delicacy to the flavour, set off by the creamy Spanish cheese. Along with the food menu came a list of today's drink specials. Conveniently divided into 'before', 'during' and 'after', they offered an intriguing diversion from the usual. Cocktails are all too often out of reach of the frugal consumer, but many of these drink specials were well under $10. While a mojito with vanilla and aniseed was hard to turn down, a mix of cachaça, ginger, lime and chilli won the day. Each ingredient was immediately distinguishable in every mouthful, yet at the same time it delivered one, united flavour. Particular notice needs to be made of the service at Markov Place. The waitstaff were knowledgeable, friendly and interested. They were keen to talk about the specials and offer recommendations. Not long after we'd been served a waiter came over to let us know the kitchen was closing in five minutes and ask if we wanted any more food or desserts - it wasn't pushy, only helpful. A curious inquiry as to the range of mushrooms had the waiter, unprecedently, offering of his free will to check the list with the kitchen. They were receptive to feedback and generally looked happy to be there; as were we. oh, i had the eggplant fritters the other week - they were incredible, light, not too oily, in a word - yum. the scallops look incredible. i am jealous of your eating out schedule. Yea, the eating out schedule has been pretty pleasing of late! I'll have to look out for the eggplant next time we go back. That's the problem tho - there's so many new places to try and so many great places to go back to!